Off to a slow start because there is planning to finish in the north-western corner of the trench before we can set people to work on the site. This left a group milling around with nothing to do until after 11 o’clock, the problem being exacerbated by a lack of finds to wash.
To the south of the hollow way, there is a very nice flinty surface turning up that is perhaps the last proper metalling of the road. Its relationship to the chalky patch that has been visible since we first removed the turf is unclear, although as Chris is trowelling back the remains of topsoil in this area, a relationship will be revealed eventually. There’s a plastic button from the surface of the road (probably 1950s or 60s in date) that can’t date the road: it’s presumably worked down through the topsoil. Almost as soon as starting to remove the clay floor, a number of fragments of what appears to be an early nineteenth-century plate turned up. Whether this is something compressed into the top of the floow after abandonment or evidence for a Georgian cottage on the site, I don’t know. I’ll need to check the Enclosure Map again in more detail just to see if it does show something here that I’ve overlooked. In the hollow way, a complex series of metallings is showing up on the south-eastern edge. Presumably, there are different repairs over many years, with only traces of the original surface. There is an area of large cobbling, an area of flinty gravel/pebbles and a patch of chalk gravel. How any of these relate, if at all, to the chalk flecky deposit on the north-western edge is currently masked by the mucky topsoil in the bottom of the hollow. Phil is now sorting that out. We are now virtually free of topsoil (at last!). The weather has been relatively kind to us today: although the forecast all week had been that Saturday would be the wettest of the week, the heavy rain is stuck in the west and won’t be with us till this evening. We can but hope that tomorrow will be okay, too. What has become irritating today is that the wind is picking up, making it very difficult to use the paper records. The clayey deposit, context (2), is proving less intractable than I had feared, as it’s remained quite damp underneath the harder crust. It’s also apparent that calling it ‘clay’ isn’t at all accurate: if anything, it’s a slightly clayey loam. This probably means that it isn’t a floor, although it might be derived from a clay floor by post-abandonment bioturbation. The material coming from it is no later than the earlier nineteenth century (and in some cases, older still). Nigel and Tony are really cracking on with the planning, which means that we’ve got everyone working. We won’t be able to finish the plans of context (2) until Mick returns with the spray (he left two hours ago for an hour – these things always take longer than anticipated). The next bit to deal with is the patch of chalk in the hollow way that’s been visible all the way through: it’s apparently immediately under the turf and on top of the topsoil, so it’s becoming urgent to get it removed. In the south-western extension, Freddie and Claire are beginning to remove (2) and it’s coming down onto a chalk rubbly deposit, even more chalky than the material on the slope of the hollow way. It’s beginning to look as if the chalky deposit could cover the entire site, which is unexpected (I’d have thought that things would be different either side of the hollow, but this is apparently not the case). We appear not to have any finds labels. This is a bit worrying, as we are going to have to label the trays much more rigorously as we begin to dig more than one context at a time. These sorts of issues should have been sorted out long ago. We really ought to have a stock of consumables like this that can be used all year round, not just for the summer excavation. How many archaeologists does it take to trowel a five-metre square? Mick has now got the spray working, which ought to help us see the contrast between context (2) and the apparently underlying chalk-flecked material. Once that’s done, Tony and Nigel can plan the area and we can get everyone on to removing (2). Even with the spray, though, the soil now looks mostly greyish. The finds from (2) appear to be mostly later eighteenth-century in date. There’s a piece of tin-glazed earthenware that may or may not be transfer-printed; if it is, then it pushes the date into the later 1790s at the earliest. This will be where checking the Enclosure map helps me understand whether or not we have the floor of a building here. There has also been a rather nice ceramic marble (small find <3>). In the south-western extension, there is a deposit that we are treating as (2) provisionally because it is exactly the same colour but is rather more clayey. Could this be the parent material for (2) proper? Deposit (3), Muriel’s chalky patch, which is clearly overlying the topsoil, is immediately next to a small hollow that was visible even before turf removal. It’s become apparent that deposit (3) is the material removed from the cut (which will need to be assigned a number of its own), probably in the not too distant past. Curiously, the topsoil beneath it appears to be overlying a clayey chalk-flecked deposit that’s unrelated to anything else in the vicinity. Over most of the site, we now seem to be largely into the eighteenth century. Given that we have a number of blanket deposits, it means that we ought to have good preservation of any deposits and features below them. Context (2) appears to be fairly thick. Although we had initially thought that it would overly the chalk flecked deposit visible on the slope of the hollow way, there actually appear to be chalk flecks within it, which were misleading us in those places where there had been over-digging of the topsoil. 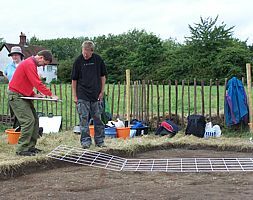 Posted on 16 August 2008, in Fieldwork, Norton Church Field Dig 2008. Bookmark the permalink. 2 Comments. Pleased to hear that things went so well on Saturday. Sorry I missed lunch at the pub! Any news on the piece of red material (tile/brick sort of thing) which I left embedded in the clay-like context on Friday? It’s still not out, though I’m convinced that it’s a piece of roof tile.